Facebook CEO Mark Zuckerberg has slammed fellow board member Marc Andreessen for his "deeply upsetting" remarks on India's colonial past and the country's recent decision to ban services such as Free Basics. "I want to respond to Andreessen's comments about India yesterday. I found the comments deeply upsetting, and they do not represent the way Facebook or I think at all," Zuckerberg posted on the social networking site. A few hours later, Andreessen, a top Silicon Valley-based venture capitalist and a longtime investor in Facebook, tendered an unconditional apology for his 'ill-informed' statements. "To be clear, I am 100 per cent opposed to colonialism, and 100 per cent in favour of independence and freedom, in every country, including India," Andreessen tweeted. "I am a huge admirer of the nation of India and the Indian people, who have been nothing but kind and generous to me for many years," he said. Andreessen has founded web browsers Mosaic and Netscape. It all began on Tuesday night (US time). Andreessen and Benedict Evans, both partners at VC firm Andreessen Horowitz, criticised India's recent move to ban differential pricing of data services. The ruling effectively means tiered internet services such as Facebook's Free Basics and Airtel Zero cannot function in India and that all traffic that flows through the internet must be treated equally from a pricing standpoint. In response to a user's comment on India's aversion to internet colonialism, Andreessen tweeted: "Anti-colonialism has been economically catastrophic for the Indian people for decades. Why stop now." He further went on to say that the Indian government has a history of taking anti-people decisions. Andreessen was probably referring to the 40-odd years after India's independence in 1947, during which its growth rate was hampered by anti-free market policies. 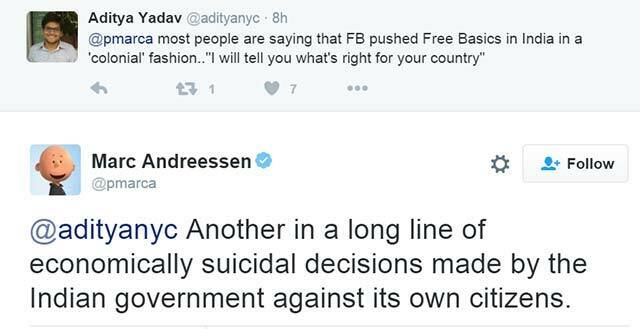 Though Andreessen promptly deleted his tweet on colonialism, the damage was already done. Netizens across social segments responded sharply to the tweet. That prompted Zuckerberg to take some damage-control measures. Distancing Facebook from Andreessen's comments, he highlighted India's importance in his life. "Early on in my thinking about our mission, I traveled to India and was inspired by the humanity, spirit and values of the people. It solidified my understanding that when all people have the power to share their experiences, the entire world will make progress," he said. With about 400 million internet users, India is today the most important growth market for technology companies after China. "As our community in India has grown, I've gained a deeper appreciation for the need to understand India's history and culture. I've been inspired by how much progress India has made in building a strong nation and the largest democracy in the world, and I look forward to strengthening my connection to the country," Zuckerberg said. A recent media report suggests that Facebook is planning to pull the plug on Free Basics in India following the TRAI ruling. A Facebook spokesperson did not respond to a Techcircle.in query till the time of filing this news report. A few days back, a 'disappointed' Zuckerberg said Facebook won't give up on providing free web access in India.